We're Not Your Average Printing Company. We offer all these printing services in house to keep your project on time and within budget. Get completely customized packaging for your products with support from our designers. You can order a single prototype or order up to 10,000 at one time. Our professional service means you will have a professional product that can’t be overlooked on the shelf. Looking for a way to check in members at your fitness center, track children at your kid’s ministry, or just want an alternative to conventional plastic cards? 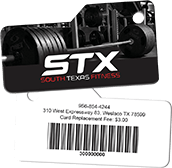 Custom plastic barcode key card tags are a practical and affordable marketing solution that keeps your logo in front of your customers and helps you keep track of current and past members. Are you tired of replacing your paper menus every time they rip or food gets spilled on them? Then it’s time to make the change to plastic menus. 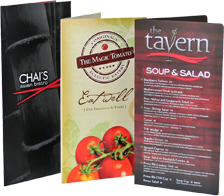 At Suncoast Identification Solutions, our plastic menus are available in a number of different sizes, formats, finishes, and thicknesses. Loyalty programs are a great way to separate yourself from your competitors, build relationships with customers, and keep them coming back time and time again. By offering a loyalty program, you reward your customers with incentives for frequent or repeat business while enticing new customers to come pay you a visit. We offer a ton of high quality and durable products, made in house and shipped to you. We pride ourselves on our ability to create custom sizes and shapes of the products we offer. Our in-house designers can create the look and feel that you are going for. For you do-it-yourselfers, we provide a large collection of templates that can be found here. Committing to custom packaging for your products will instantly set your business apart from the rest and show that you are professional and care about your customers. We can create custom packaging that is tailored to your brand and fits the specific size and dimensions of your product. We specialize in orders from just a single prototype box to orders of 10k. 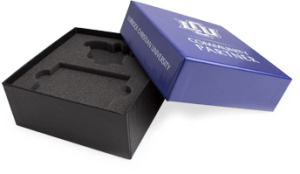 Take the next step with custom packaging, your customers will notice. 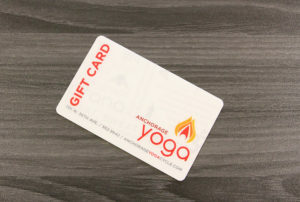 Looking to upgrade from paper gift certificates? 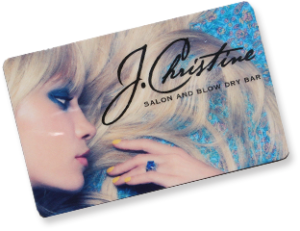 Custom gift cards are a proven way to generate revenue and bring in new business. Cardholders often spend more money than the value of their gift card, bringing in additional money to your business. Custom plastic gift cards from Suncoast Identification Solutions are made from a high-quality plastic that won’t crack or break and is more durable than PVC. f you’re tired of replacing your paper menus every time they rip or food gets spilled on them, then it’s time to plastic menus. At Suncoast Identification Solutions, our plastic menus are available in a number of different sizes, formats, finishes, and thicknesses. We offer 5, 10, and 12 mil synthetic substrate, matte or gloss finish, and lamination. Looking for a non-standard menu size? We can print menus in any size up to 11×17 inches. Let us help you create a menu that will last and allow your business to stand out from your competitors. 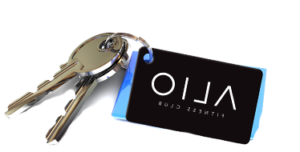 Whether you’re promoting a new business, product, or special offer, custom plastic door hangers are great. Businesses in all industries are looking for a fun branding and promotional tool. We also offer rearview mirror hangers that can be used for parking permit tags for special events, parking facilities, and schools. 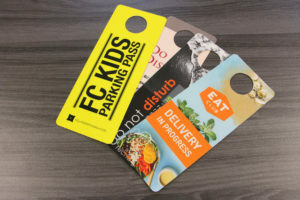 At Suncoast Identification Solutions, our door hangers are very durable and waterproof plastic substrate it withstands spills, tears, and cracks. Our door hangers, shower hangers, and rearview mirror hangers are available in 20 or 30 mil thickness.